Today I bring you a comic inspired by my students. Last week I ended up in a heated discussion with my graphic novel class about great cartoons. I was trying to make the point that Rick and Morty, even though fairly adult at times, was arguably one of the best cartoons of our time. Some kids agreed, some did not, but in the process of the argument, many of the students started tossing out cartoons that I was not very familiar with, many of them from their childhood, and as I grow older, it gets harder and harder for me to keep current with what the kids are watching, so I appreciate them for keeping me informed. Anyway, one of my kids tossed out Avatar The Last Airbender. My only experience with Avatar The Last Airbender is the cool ride at The Mall of America Nickelodeon Universe theme park. 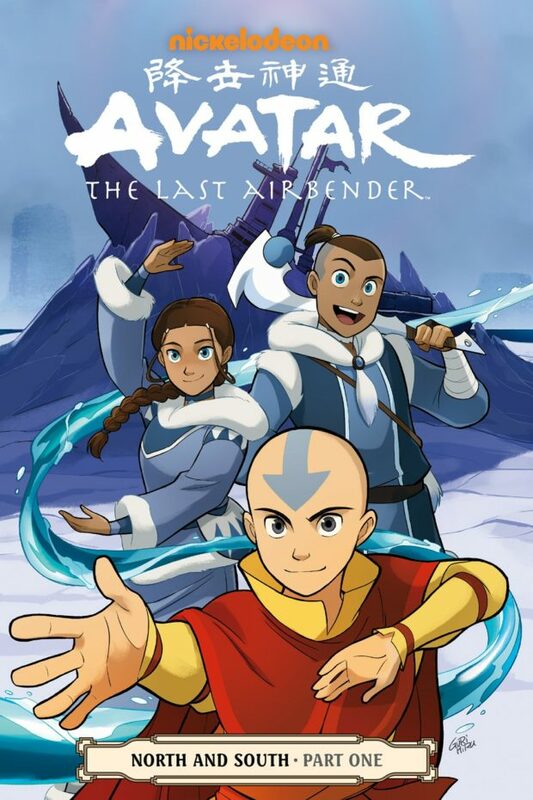 But…I’ve had this Dark Horse Avatar The Last Airbender comic on my “To read” shelf for some time, and my students’ arguments inspired me to get to it this weekend. I opened the book to see that it is written by Gene Luen Yang, which was a bonus, and the art by Gurihiru is a smooth and seamless as a wonderfully drawn/colored cartoon. Reading North and South – Part One does not give the reader a full immersion into the world of Avatar, but it does contain enough information for the enclosed story. I think it does a wonderful job of filling in parts of this universe to inspire the reader to search out more of the story but gives them all they need to enjoy the 80-page book. This particular story follows the brother sister pair of Sokka and Katara as they return home after a good amount of time adventuring to a much different village then they had left. Sister Katara is an amazing Waterbender, meaning ( I think) that she has the ability to manipulate water molecules to her bidding, and her brother is not a bender, but he seems pretty good with a blade, and obviously exists as the goofball of the family.